If you’ve yet to build a winter car survival kit, now’s the time. Those of us who live, work, and play in the mountains see the first signs of winter earlier than most. And once it’s here, the mountain peaks will be capped white with snow and roadway conditions will change for the worst. Icy roads and deep snow are extremely dangerous for travel and a leading cause of stranded vehicles. Every year, we hear stories of motorists stranded in blizzards. Sometimes it’s only overnight, but occasionally (on rural back roads) they are stranded for days or weeks. People left to huddle in their vehicle struggling to stay warm. Far too many of those sad tales end in tragedy. However, with some basic survival knowledge and a stash of survival supplies, your odds of surviving stranded in a winter blizzard goes up significantly. These are supplies everyone should store in their vehicle for winter travel. It’s called a winter car survival kit. This kit will help you accomplish two things. It will help you get unstuck should your vehicle slide off the road. And this kit will help you survive should you not be able to get your vehicle unstuck. Your best bet is to be self-sufficient and avoid spending a night (or longer) stranded. So it’s worth having a few key tools in your vehicle to get you going again. Mainly, the preventative equipment required for self-rescue consists of 1) ways to remove (or simply move) snow and 2) traction devices to help you get a grip on icy and snowy surfaces. Plus a few items to make the use of these items a little more convenient. A good, sturdy shovel is an absolute must for a winter car kit. Often, some efficient digging can help you quickly get free. And even if you still can’t get your vehicle free, a shovel will allow you to keep your vehicle from being entirely buried under a snow drift. Because a vehicle that’s completely buried in snow is nearly impossible for a rescue team to spot. Or if worst came to worst, you could use a survival shovel to build a snow shelter. In all winter weather conditions, you’ll have to remove a lot of snow and ice from your vehicle’s roof and windshield. A good, heavy-duty scraper and brush with a long handle will save you a lot of time and effort, as well as make it easier to see out your windows, keeping it out of the ditch. Have one of these is a must have all winter long. I’m always amazed when people are huddled in their cars for 30 or more minutes waiting for their vehicles defroster to warm their windshield because they don’t own a scraper. Often, a little extra traction is all that’s needed to get moving again. Many people use sand or kitty litter, but these items only work once and then you’re out of luck. A set of traction mats are reusable and can be easily repositioned to keep you heading in the right direction. In packed snow road conditions, tire chains are an excellent way to help with traction and prevent sliding in the first place. However, they are a controversial topic, so make sure to check the local regulations regarding their use. Many western states, require tire chains in severe conditions. In the Midwest, they are illegal in most jurisdictions even during the worst snows. If you carry chains, make sure you know how to install them – put them on first in your dry driveway and later in a snowy parking lot. It’s a lot harder to get them on tight and secure when it’s dark, and you’re fumbling with cold hands, so you’ll appreciate the practice if the need arises. A small tarp makes kneeling in the snow (and roadside slush) a lot easier and drier. It also helps keep you from losing parts or tools into the snow. A 5’x7′ tarp is a perfect size for a lot of roadside uses. Cold weather is rough on your vehicle’s battery, and it’s easy to find yourself unable to start the engine when you need it most. A self-contained battery jumper is a simple solution and much better than waiting for another motorist to jump start your engine. 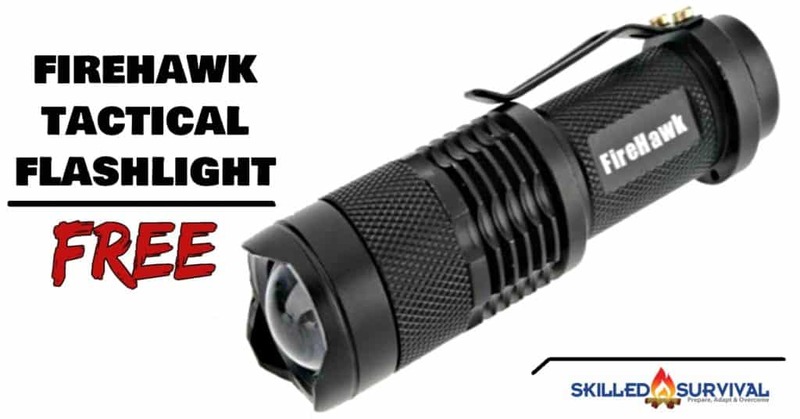 All survival kits need a super bright LED EDC flashlight. If it’s dark out or the blizzard has blocked the sun out you’ll need illumination to see what you’re doing. Also, it’s a good idea to keep a spare set of batteries in your winter car survival kit as well. If you have to stay out overnight, you’ll need a few more things. At this point, your focus turns from getting your vehicle out, to keeping yourself and your passengers protected from the elements. In the winter, the colder temperatures often trick people into assuming they don’t need to drink as much water. You tend not to feel as thirsty. The truth is you need to stay hydrated to maintain proper body temperature, no matter the weather outside. Want proof? High-altitude mountaineers spend about as much time melting drinking water as they do climbing – it’s THAT important. A stainless steel water bottle is an excellent choice since you can use it over a camp stove or small fire to melt and heat water. Never eat large amounts of snow directly. Always melt the snow before ingesting. If you eat snow directly, you’re basically using your internal body temperature to melt the snow. This can lower your core temperature and lead to hypothermia. What good is finding water if you can’t drink it? You should always purify your water before you drink it whether it’s coming from your tap or from the snowbank where you’re stranded. The easiest way to purify water on the go is with a LifeStraw Personal Water Filter. We put the LifeStraw through our field testing and, if you’re not convinced you should be carrying at least one in your vehicle, you should read the full LifeStraw review and watch the video below. Tip: if you have kids or grandkids that you drive around, make sure to get them each a LifeStraw. The last thing you need in a survival situation is kids refusing to drink from the same LifeStraw. In the cold, your body is craving calories in any form, burning them at an increased pace to keep your core body temperature up. Cookies, crackers, nuts, dried fruit, plain chocolate bars, jerky. I like the high-calorie bars since you buy them once and you’re food preparation is done. Snickers bars may taste great, but you’ll chip a tooth on the caramel trying to eat one that’s been sitting in sub-zero temps for even a few hours. If you’re able to heat water over a stove or fire, consider adding powdered hot chocolate or another warm drink with lots of calories. If your vehicle is stuck in the snow, chances are you’ll int the cold for an extended period of time as you attempt to get out on your own. Quite often, this can leave you snowy and wet, a bad combination for cold weather survival. Carrying a change of clothes and some extra insulating layers will let you get out of any wet clothes and warm up while you plan your next move. Gloves are a must. If you’re trying to do any of these survival tasks with bare hands you’re not going to be successful. I like Mechanix brand gloves since they provide me the dexterity to perform survival tasks. Try lighting a fire with thick mittens on; not fun. You can go with a thick wool blanket but I prefer an all-weather reflective emergency blanket. These blankets are made with a heat reflective internal layer that helps trap the body heat you’re generating. Also, consider how many people you’ll be traveling with and be sure that you can keep everyone warm. With so many paracord uses for survival, it a must-add item to any survival kit. You should spend a few dollars more to get Firecord. It’s designed with 7 strands of paracord and 1 strand of Fire Cord you can use as fire tinder. These fire starting shoelaces are also a good idea since you might not always be riding in your own vehicle and your shoelaces can go everywhere you go. Keeping a box of waterproof strike-anywhere matches. You might also add an electric coil windproof lighter in your vehicle as well. A fire will allow you to keep warm, melt snow into water, and signal searchers. Your matches and lighter won’t be worth much if you don’t have something dry enough to burn. In dry, cold conditions (like the Rocky Mountains), you may be able to find enough dead, dry wood to maintain a small fire, so a fire starter makes a wise addition. In wetter climates (like the Cascades of the Pacific Northwest), finding anything dry enough to burn is always a challenge. So adding a small portable camp stove is a better option. Obviously, extra fuel can be handy if you’re relying on your vehicle for shelter. Running the engine for heat will help keep you warm, but it will also slowly drain your gas tank. Carrying a couple of extra liters of fuel in a sturdy container will give you a bit of a buffer in case you run out. Oftentimes when you’re stuck out in the cold it’s due to a mechanical breakdown or an accident. Other times, it’s because mother nature reared her ugly head. Icy roads, snowstorms, freezing rain, and other winter weather patterns are common reasons why you’re forced to pull over and wait until it’s safe to start traveling again. Typically, you won’t want to continually run your vehicle while you’re waiting out the weather which means you won’t be able to listen to the radio without risking draining the battery. It’s always important to keep your “ear to the ground”, as they say, to stay updated on the weather. By keeping the credit card sized Kaito Pocket Radio in your winter car survival kit, you’ll have a pocket-sized connection to the outside world keeping you informed on the weather and whatever else is going on around you. Keeping your mind occupied and having a little fun can help make any survival situation a lot more enjoyable. Your first priority will be making sure that you, and your loved ones, will live to see another day. Once you have the situation under control and you’re monitoring the airwaves with your pocket radio, there’s nothing wrong with breaking out a deck of survival playing cards and making the most of it. We love these survival playing cards because, like most survival gear we love, it serves more than one purpose. They are, of course, a standard deck of playing cards but they are also an educational tool because each of the 52 cards has either a survival or emergency situation described on it and tips on “how to survive it”. A large zippered duffle bag is a great way to keep all your winter travel survival supplies organized and contained in your trunk or under the back seat. Once you’ve assembled your supplies, choose a bag that will fit them all. It doesn’t necessarily need a lot of pockets, but make sure you have a way to separate your spare gas can and your camp fuel from the rest of the gear. This action plan can be summed up in just two words: Do It. Invest in the gear and supplies listed in this article. Then put them all in a duffle bag and put this bag full survival items in your trunk. You have zero excuses not to do this. If you drive in winter conditions at all, it’s your personal responsibility to invest in a few essential tools and supplies. This responsibility goes double for anyone who drives others around. That means parents of young children and those who take care of handicap or elderly. The time to take meaningful action is NOW before the first flakes begin to fall. Not bad!. As a deputy in NE Calif, I was involved in multiple rescues in remote areas of Modoc County Ca. The locals are always prepared, however some out of area folks like to take drives in the winter and frankly do not pay attention to signage and their surroundings. The kit you suggest is solid, and the skills to use the kit would go along ways in keeping one, or a family alive until a search and rescue are deployed. In each incident I was present at, zero citizens were not prepared for even an overnight stay. In two instances, after the recovery, on snow machines, their vehicle sat for months, until the snow melted and vehicle recovery was possible. Nicely done. Hopefully your readers will read and heed your advice. If they are to carry water in the vehicle they need to leave 10% of space for expansion if the water freezes, if water is buried in snow with a minimum of 8 inches all around it will not freeze no mater how cold it gets. If the engine is being used to heat the vehicle then the exhaust pipe needs to be clear of snow or it will push carbon dioxide into the car and suffocate the people within. Only a few heating systems can be used without depleting oxygen, the cat series of heaters and Mr heater are two though care must still be taken..
Shovels should be metal, steel if possible aluminum at worst as plastic shovels will not work well on hard packed snow. These are great. Even if you are in weather that’s not snow. It’ll help with getting stuck in the mud, or loose sand too. Water is something that I carry in my car, but I carry it incase the car needs a top up, not for personal drinking. The water light came on one day I was driving, and I had to drive for another 40 odd miles with a low water level! Ever since then, I carry a bottle in the boot. My wife and I live in northern Idaho, and we have witnessed first hand, just in the past few days, a road accident involving an overturned vehicle on a blind turn. The road conditions were icy. An item, or items, we discovered are very useful during these types of accidents, are reflective energency roadside triangles or emergency roadside flares. Deploying either of these will help keep other vehicles from driving arouund the blind curve, and making matters much worse!